As UK fans will know, Derek series 2, episode 1 aired on Channel 4 last night and there was an amazing buzz on social media, which ensured that Derek trended on Twitter from 9pm until way into the early hours. It started at 9pm as Ricky Gervais begun a Twitter Q&A with the fans, where Ricky prompted fans to ask him questions about the new series with hashtag #Derek. In no time at all, #Derek was trending and it continued up until the start of the episode at 10pm. Due to some genius, innovative scripting, Ricky incorporated the character's official twitter handle into the show @MrDerekNoakes and as Derek asked Vicky to tweet out "#dereksays Be nice to animals", the show's creator did exactly that - in real time - as the line was read out on the TV, gaining a massive 7,500 retweets and counting! 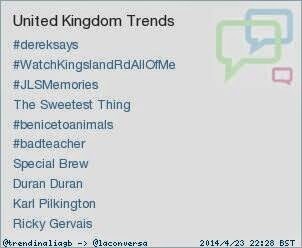 Within seconds #DerekSays was the top UK Twitter trend, and this, supported by quote/meme-style picture tweets from @DerekTVShow, led to not one, but six Twitter trends from the show breaking into the Top 10, namely #DerekSays, #BeNiceToAnimals, Duran Duran, Special Brew, Karl Pilkington and Ricky Gervais. By the time the show ended, all six were trending together and three of them continued to trend for another hour as the repeat show on Channel 4+1 came and went. At 10.30pm, as the credits rolled, Ricky Gervais also released exclusive unseen footage on his Facebook page of Dougie pondering whether or not he should continue to be a 'germ in a puddle' at Broad Hill Care Home, a video which amassed a staggering 500,000 views in just 30 minutes. 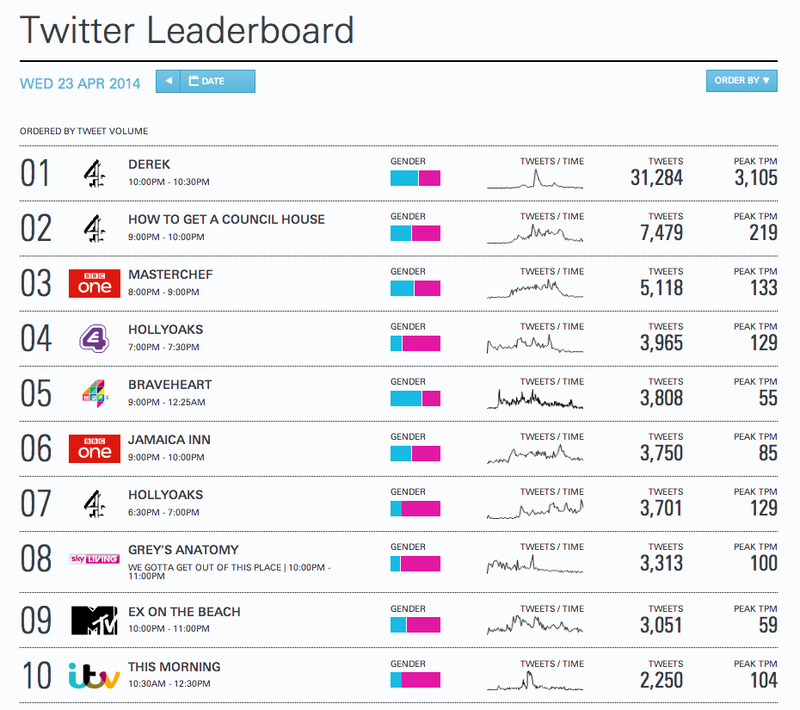 This morning, the social TV analytics company, Second Sync, released their daily Twitter leaderboard and unsurprisingly, Derek was the most tweeted-about TV show on Wednesday, April 23rd - and by a huge margin. With a peak number of tweets per minute of 3,105, and a total of 31,284 tweets during the show, Derek Productions, Channel 4 and Ricky Gervais took over social media last night and we expect it to continue building momentum in the coming weeks!